Metal Studio Workbook: In a pickle. All about pickling solutions and how to dispose of them. In a pickle. All about pickling solutions and how to dispose of them. It's Q & A time, and one group of frequently asked questions sent to my email inbox is all about pickle. So, since for every 1 student who asks, at least 10 more were wondering about the same thing, I thought I would share some helpful and hopefully not too boring information about that funny cleaning solution we jewelers call pickle. Pickle is the solution used to clean metal, especially after soldering - to remove baked on flux and oxides that have formed on the metal. The oxides are typically concentrations of copper in the metal or alloy that come to the surface during annealing and soldering. The pickle strips these oxides, called fire scale from the surface. For example, the copper in sterling (an alloy of 925 parts fine silver and 75 parts copper), concentrates on the surface of the metal in a not too handsome black or copper colored stain when it is heated with a torch in an oxygen rich environment, or what we lay people call "air". Even though soldering or annealing in a vacuum or room filled with inert gas may help to stop fire scale, I'm addicted to breathing oxygen and don't have any immediate plans to stop. First point about pickle that is often confusing to students is that pickle removes fire scale, not fire stain. Fire scale is the oxide that sits on top of the surface, drawn up and through the metal by the heat and oxygen. 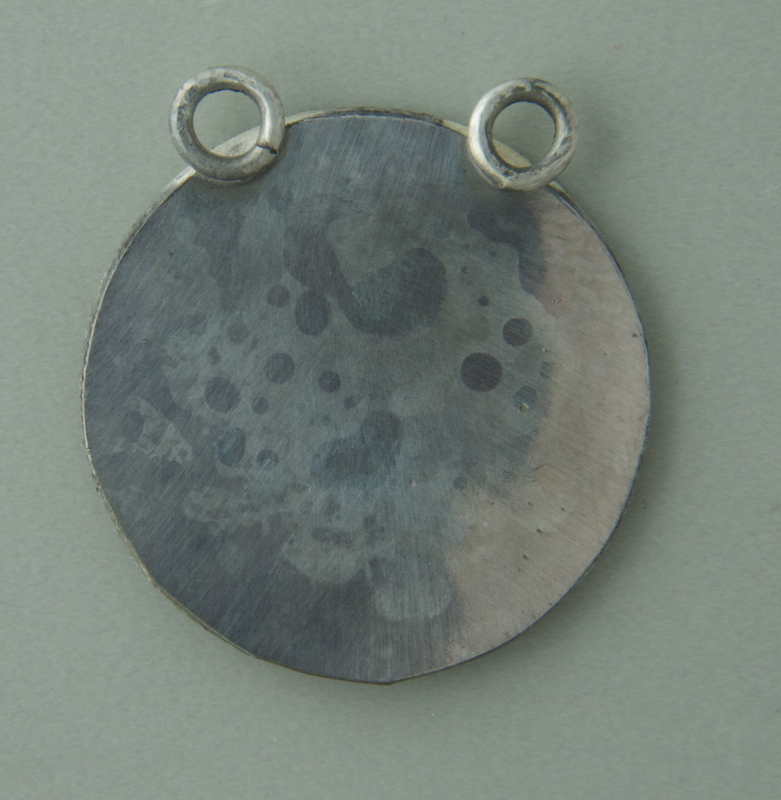 Fire stain, is the dark grey or copper colored oxide that is still inside the metal, visible just under the surface. Fire stain can't be removed by normal pickling and must be sanded off with abrasives. So, when students first use pickle, they're stunned to still see copper stains on their sterling, even after soaking it for a long, long time. That's the fire stain. All the surface scale has been cleaned away, but the stain inside the surface is still visible and not going anywhere without persuasion, no matter how much the students beg or plead with the teacher. Even more confusing, sometimes sterling will come out of the pickle looking matte white like fine silver, but with a slightly clouded blotchy mottling. This is from a process called depletion gilding. Repeated heating and pickling of your sterling strips away copper oxides (fire scale) and depletes the sterling at the surface of some of the copper content in the alloy. Eventually, the sterling will be go from black or copper stained with firescale to matte silver white. This thin fine silver layer, or loam, is a frail mask over the fire stain, which is still there, underneath. In fact, it is that scale that is making the matte silver color look blotchy and cloudy. As soon as any abrasive polishing is done, the fire stain is revealed and back with a vengeance. Incidentally, depletion gilding metal is used to coat everything from castings to tableware, covering incidental fire stain, and if burnished with tumbling, etc. can be polished as a bright, fine silver "plating" over sterling. Okay, you can't understand pickle without talking about fire scale, but back to pickle. 1) What's the best pickle to use? Well, if you're working at home or in a home studio or if you're concerned about eco-friendly chemicals, then I would suggest vinegar based or citric based pickles. Sounds yummy. Back in olden times, the first pickle cleaning solutions were made with alum, as in what you use to make, well, pickles. After that, pickle solutions became more aggressive. 10% sulphuric acid and acid substitutes like sodium bisulphate (aka Sparex #2 brand pickle solution for non-ferrous metals like copper, sterling, brass, etc), are your typical studio or shop choice. They're effective, but testy. Acid solutions and Sparex don't like steel tweezers or any steel being put into the pickle pot - it reverses the flow and puts copper back onto your metal. So if you wanted pink, coppery colored sterling, you got it. Taking the steel out of the pickle stops the reaction. Sparex splashed on clothing and surfaces can put pin holes in clothing and bubble floor finishes. It's durable and long lasting, but it also has to be neutralized with baking soda before disposing of it (see disposal of pickle later on in this post). Instead, you can use home friendly pickle solutions like citric acid or vinegar and salt. Citric acid is a baking product and you can buy it in bulk or you can buy brand name citric acid pickle solutions like Black Magic Biodegradable Pickle. The brand name solutions seem to work better than just using straight citric acid and come with mixing instructions, usually something like a heaping tablespoon or more per cup of water. It definitely takes more citric acid than Sparex to make the same volume of pickle. But, on the plus side, this stuff is all natural, doesn't mind steel at all (no adverse or copper pink reactions to steel) and no neutralizing required. I've stored citric pickle in the pot for more than a month with no mold, etc and I've had students report that they've stored it for a couple of years in a jug and it was still effective. Interesting fact: if you mix some brands of citric acid based pickle you get a strong vinegar vapor that gets worse when heated. We're talking coughing and abused nostrils like a mild tear gas. Not fun. So, don't mix brands. Dump the old solution (see below), clean the pot with soap and water and add the new mix. Looking for citric acid at the grocery store? Well, look for drink mixes high in ascorbic acid, aka citric acid, like Crystal Lite drink mix. It's refreshing, lemony, and it will strip scale from sterling. Delicious! However, drink mixes are also near opaque and very "warm lemony" smelling, and not very effective, so this is not my preferred natural pickle mix. Another natural mix is vinegar and salt, one teaspoon of salt per cup of vinegar. Heat it as usual in your clean pickle pot and you have your own homemade pickle. And a lot more home friendly than Sparex or diluted acid. No pickle and no ingredients? Well, in a pinch you can use almost boiling hot water to remove the flux and even a lemon, sprinkled with a pinch of salt, rubbed over your metal will clean it (especially if you boil off the flux first). 2) Do I have to heat pickle? Can't I use it cold? Yes you have to heat pickle. Yes you can use it cold. Wait a minute. What? Well, yes, pickle is more effective if you heat it up. Don't boil it, just use a crock pot or pickle pot, set on low, to warm the solution up until it steams. When it's hot, your pickle will strip off the flux in a couple of minutes and get to work on firescale soon after. In five - ten minutes it's probably ready for more soldering. Leave it in longer to clean off the most firescale possible. In fact, and this is where using cold pickle comes into play. You can leave your metal in the pickle for hours, even overnight. Cold pickle takes time to work, but in the shop, we'd leave metal in the pickle overnight to soak, with the pot turned off for safety, and come back to nice clean bits to work on. Whatever you do, citric or sparex, natural or toxic, don't use a microwave to reheat your pickle once it's been used and has started to absorb copper. Especially if you share that microwave with food. I don't want a burrito that tastes like pennies, no matter how interesting that sounds. 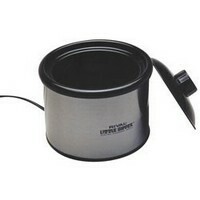 Besides crock pots, other pickle pot solutions include used, no longer for baby, bottle warmers or mug warmers. And remember, once you use a crock pot for jewelry, it's not for chocolate fondue or slow cooking anymore - unless you're trying to make yourself a "last supper" you'll never forget. 3) When is my pickle done and used up? When it doesn't work anymore. Well, duh. But you can tell it's done when it turns bright blue from all the copper it has absorbed. As it gets more and more blue, pay attention to how long it takes to pickle your metal. As you get more experience with pickling, your "pickle senses" will tingle with impatience when it's taking too long for something to clean. That's a sign that it's done. Just don't mistake that deadline you procrastinated on and the rapidly approaching arrival of your customer with bad or defunct pickle. Also, if the pickle gets contaminated and your metal is coming out gooey or coated with annoying substances, it's time for a new batch. 4) How do I dispose of pickle? For Sparex or dilute acid pickles, you have to neutralize your pickle before you can dispose of it. Time for fun with science! To neutralize an acidic solution (pickle) you add a base (like baking soda). Before you dump some baking soda in your pickle pot, check this out: adding a base to acid increases the volume of material rapidly, like a volcano experiment gone wrong from science camp. So, cool off the pickle and dump it in a larger container, like a bucket. Add baking soda until it stops fizzing and foaming. Now it's done. For citric acid or natural pickles, no neutralizing is necessary. Just let it cool and you're ready for disposal. But before you dump any pickle solution down the drain - stop! Natural or neutralized, green or blue used pickle is full of copper and local cities often have rules about dumping copper into the water supply. They don't like it. You have to dispose of it properly, like taking it in a labeled container to your hazardous waste dump and turning it in. They may laugh at you, but in your heart and behind those tears you'll know that you did the right thing. The geeky thing, but the right thing. There you have it. If you want more, more, more information about the wonderful world of soldering, grab a copy of my book and/or dvd, Soldering Made Simple: Easy Techniques for Kitchen Table Jewelers, or sign up for a class with us at the Silvera Jewelry School in Berkeley, CA. Have some tips about pickle - the jewelry kind, not the edible kind? Then please share it here. And thanks! great article! thank you. So how about a tip on getting the copper off a goldfilled soldered ring. Super pickle (hydrogen peroxide) is a bad Idea because your solder will turn silver. What kind of polishing method is the best without grinding away too much of the metal?m I used a dremmel with a polishing tip and ZAM but the gold still looks a bit pink. Hi - the best way to remove firescale from filled metals is to prevent it in the first place. Try using firescoff or Cupronil to eliminate or minimize any scale. By protecting the whole piece, the extra time spent fluxing will be recovered 10 fold in time saved during pickling and polishing. Are you using low karat gold solder ( I use 10, 12 or 14 karat) or yellow tinted sterling solder for your gold filled? These can also help you avoid the dreaded solder line. I don't know of any magic bullet for removing scale on filled metals other than polishing - always risky, but if you protect with scale retardant flux, avoid overheating, and use gold or tinted solder your gold-filled should be a lot more seamless looking and happy. Ohmigaw! This is great! Exactly the info I needed. Thanks so much. Just set up a salt and vinegar pickle pot. It works very well, I am quite pleased. Thank you so much for the great info. Thanks so much for your article. It's very informative and I hope you don't mind me sharing a link to it from my website. Can find citric acid in a well stocked spice section too: sour salt. I think - but am not sure - citric acid is also sold for canning. Also I am embarrassed to say I accidentally left my pickle on the other night with the lid off to boot! In the morning it was 3/4 evapoeated and I added more water to the crystallized pickle. Would that make it lose it's strength? I want to remove color and foil from my ring! It is set in a platinum coated silver setting. Can I pickle it off & which pickle is best. Heated? I've heard that unless you neutralize your piece after it's been pickled, (in a baking soda and water solution) the pickle will continue to work on the piece, and wear away at it. True? Well, that was a pretty fascinating read, not going to lie. I really hope you continue to write. Probably one of the more informative pieces I've read on this subject. Thanks! this is so really nice . please check this . I left my pickling solution sit for many months and upon returning I found the bottom of the solution crystalized. Should I just reheat? Do I have to change it and use fresh pickle? Thanks for the great tips! We offer home cleaning services but often clean metal around people's homes, this will be very useful. Awesome to hear another use for the fantastic eco friendly cleaner vinegar too. Thanks for sharing the beautiful information. Hello, I'm a sculptor who did lot of jewelry when i was in school in the 90s and since I've been fabricating and casting large objects. Until a few weeks ago when I decided jewelry would be a nice change of pace, but little did I know just how much you forget in 20 years. So I cast two silver rings and needed to pickle them. I bought Rio Pickle and mixed a new batch per the instructions and placed them in the warm sulfuric. When I saw they looked clean I took them out and rinsed in water. After they dried though I noticed that in the texture, undercuts and inside the cast bezel there is a whitish yellow chalky looking substance that is tough and im having to scrape it off with a file. I know it's been a while, but pickle is simple and I don't remember that ever happening before. Would one of you nice folks be able to tell me what I did wrong? And suggest the best way to remove it? I followed the directions to the letter when I mixed the acid and the crock pot I use to heat it was new so it was clean. This article is not only helpful but fun to read. I am an avid fan of eco-friendly solutions for housekeeping and, I must say your eco-friendly suggestions on the first question hit the spot. So. I finished a beautiful cuff. Bracelet for my step mom and fell asleep (sitting up on the couch, tools in hand) after dropping it into the pickle to clean up. I got it out as soon as I remembered it today but discovered the finish is....ruined; red and angry and soft-ish. I don't have time or stock to replace it - is there anyway to restore the copper finish?? Great article;fantastic knowledge and sense of humour, thanks for sharing both. Great article! You answered all of my questions about pickle in a way that was easy to understand as a new aspiring metalsmith. I've over pickled and my silver has gone dark grey. How do I remove this? Unknown re: I’ve over pickled and my stuff is all grey: That can happen if you leave your stuff in the pickle for a long time and/or if your pickle mix is too strong. When I’ve used too much Sparex mix, for example, it turns the metal grey. For me the easiest solution was to polish it. That removed the grey coating. re: Small factory in India and 650 silver. Well, with that high of a copper content, you’re going to have some pink silver. I don’t have the info for you about electro-stripping, but that could work. You probably just have to polish it off. Hopefully it can be removed with mass finishing and abrasives in a tumbler. Does pickle remove tarnish? No. Use tarnish remover. Never use pickle to clean finished jewelry. It can be bad for stones and will matte your finish, and not in a good way. If your pickle evaporates away: if you still have water in there, add water to fill it back up. If you evaporated it down to bone dry, try adding boilling hot water to melt the crystals. Sometimes allowing your pickle to steam away to dry can ruin your crockpot or even worse - be a fire hazard. Be sure to shut it off when you’re done. Removing color and foil? from a platinum coated silver ring with a moissanite stone: Well, I gotta say, I’m a bit lost on this one. I haven’t heard of color and foil on a ring, nor platinum plating. Rhodium plating yes. My gut says pickle will not help with any of that. If it’s just dirty, clean it with an ultrasonic or take it to a jeweler for cleaner. Re: Scutlptor from the 90s with chalky residue: Um, not that you have chalky residue, per se, but actually your jewelry. I’m sure you’re very clean. Anyway! Sounds like your pickle wasn’t completely rinsed off. When you take stuff out of the pickle, rinse it thoroughly in a bucket of water with tablespoon of baking soda added to it. The baking soda helps to neutralize the pickle. When the rinse water starts turning blue, dump it and make a new batch. I'm uing a PH down pickle. I pickled a heavily fire scaled blank, and it turned yellow, like brass. I pickled several other copper blanks with it, and they all came out fine, any thoughts? PH Down is mostly Phosphoric acid, I will try the scrubbing, thank you! Mix your used pickle with baking soda until it quits foaming/releasing Carbon dioxide, you will end up with precipitated carbonates of any heavy metals. These carbonates are not very water soluble. You can then dry out the metal containing sludge. If there was substantial Silver in the pickle, take it to a refiner and recycle. If not, mix the residue with cement powder and cast a chunk of concrete into a glass jar, making the metals relatively safe from leaching, then dispose of it in a landfill. PS Joe Silvera! I have your book. Loving your work!